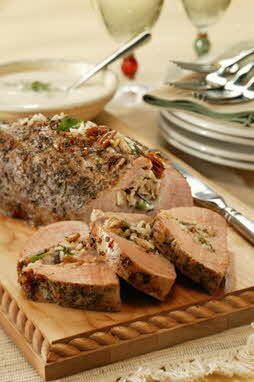 Cut lengthwise slit in each pork tenderloin, cutting to but not through the other side. Set pork aside. Melt butter in large saucepan over medium heat. Add mushrooms and green onions; cook until tender. Remove from heat. Stir in cooked long grain and wild rice mix, pecans and parsley. Set aside 3/4 cup of the rice mixture. Spoon remaining rice mixture into 1 1/2-quart casserole; cover and set aside. Divide 3/4 cup rice mixture between slits in pork tenderloins, spreading evenly in slits. Close slits; secure with toothpicks. Roast tenderloins, uncovered, for 25-30 minutes until internal temperature is 160 degrees F. Bake casserole of rice mixture alongside tenderloins. Meanwhile, for sauce, combine Alfredo sauce and Chardonnay in medium saucepan. Cook and stir over low heat until bubbly. To serve, spoon rice mixture onto serving platter. Remove toothpicks from tenderloins. Cut pork tenderloins into 1-inch-thick pieces; arrange on rice mixture on platter. Serve sauce with pork and rice mixture. This dish requires a bit of extra work, but with pre-packaged ingredients it goes smoothly. Serve with a tossed green salad and for dessert, Holiday Fruit Compote (finishing touch category) over pound cake.